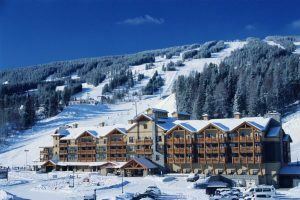 The Trickle Creek Lodge (formally know as the Marriott Trickle Creek Residence Inn) is located right in the heart of Kimberley Alpine Ski Resort just outside of Kimberley providing immediate access to the ski terrain. Surrounded by the natural beauty of pristine mountain wilderness, this premiere resort offers a superb location for skiing and snowboarding. Inside, there are lodge pole pine beams and river rock pillars providing a rustic elegance which is sure to delight. This Kimberley ski accommodation offers 80 guest suites including 19 studios, 41 one-bedroom suites and 20 two-bedroom suites. These spacious studio suites and 1- or 2-bedroom suites are 50% larger than a regular hotel room. They all come with a full kitchen, gas fireplace, balcony, separate living area, and a beautiful view of the majestic Rocky Mountains or the ski slopes of Kimberley Alpine Ski Resort from your lodge pole pine balcony. The Conference and Banquet facilities makes the Trickle Creek Lodge an ideal setting for a corporate retreat. These Kimberley ski accommodations are also located within 1.25 hours from both Fernie Alpine Ski Resort and Panorama Ski Resort. The Canadian Rockies International airport (formally known as Cranbrook airport) is just 20 minutes away. 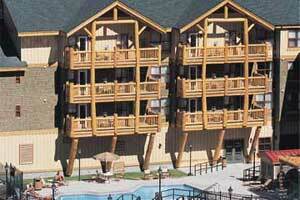 Contact us for more information or to make the Trickle Creek Lodge part of your Kimberley ski holiday.